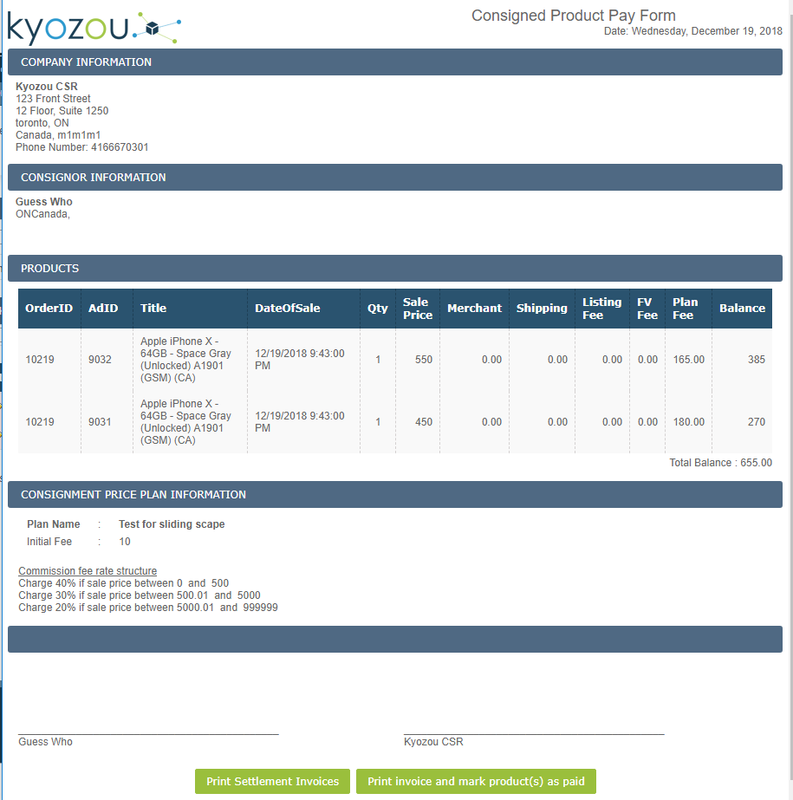 In this article, you will learn how to use the consignment feature in Kyozou. · The act of giving custody or care of material goods to a person/agency, while retaining legal ownership of the merchandise until they are sold. · Purpose of consigning could be for shipping, auctions, online or in a brick and mortar store sales. · Possession of goods transferred is agreed upon by two parties: consignor and consignee. Consignee – The agent or person who takes possession of goods until goods are officially delivered to the ultimate receiver or buyer. You will need to contact your Kyozou CSM to have the Consignment feature switched on. Once the Consignment feature has been enabled, you’ll see a new Tab in Kyozou called “Consignment” with 4 sub-menus. · Where you would be creating consignment plans as agreed upon by both consignor and consignee. · Where you can also view all consignment plans created for updating, editing and deletion. · Where you would be creating consignors with their full contact details, with an option to attach a specific consignment plan, based on individual agreements. · Where you can view all products attached to consignment plans. · It has a good overview of which products belong to which consignors, as well as the statuses of each consigned product, from available to listed with pricing. · You can access product details through consigned product titles here as well. · Successfully sold products are found here. · This is the place where you can generate invoices. · This is the section where you can settle with Paypal. · You can also print a check for your consignors. 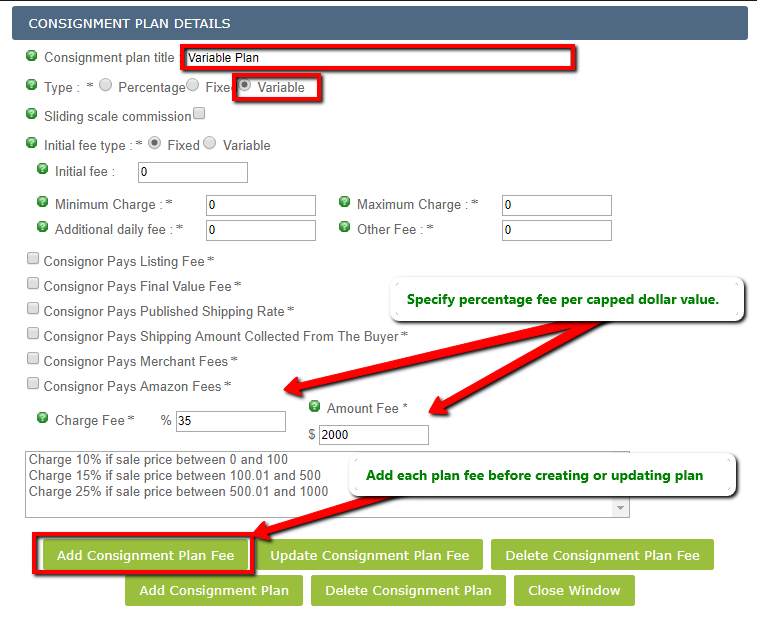 Click on the “Click here to create a new consignment plan” link and a popup will appear. In this popup you’ll be able to customize a plan for your consignors. Consignment plan title: This field is where you designate a name for this Plan. Sliding scale commission: Charge a variable rate to the consignor (example: Charge 20% if sale price between $0 and $200, Charge 15% if sale price between $200.01 and $500) can only be used with Variable plan type. Initial fee type: You can charge an initial fee to the consignor and you can set it to a fixed amount or Variable amount. Minimum Charge: This is the minimum listing fee you would like to collect when listing an item. Maximum Charge: This is the maximum listing fee you would like to collect when listing an item. 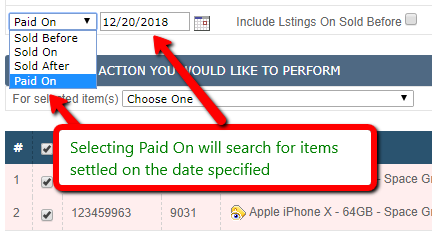 Additional daily fee: This is an additional option fee that you can collect based on the listing duration (in days) Example :Charge $0.10 per day, which would yield $1 of commission on a 10 day auction. Other Fee: This is an additional optional fee that you can collect. Consignor Pays Listing Fee: Specify if the consignor should cover the listing fee. Consignor Pays Final Value Fee: Specify if the consignor should cover the FVF. Consignor Pays Publish Shipping Rate: Specify if the consignor should cover the shipping costs. Consignor Pays Shipping Amount Collected From The Buyer: Specify if the consignor should cover the shipping costs that buyer paid for. 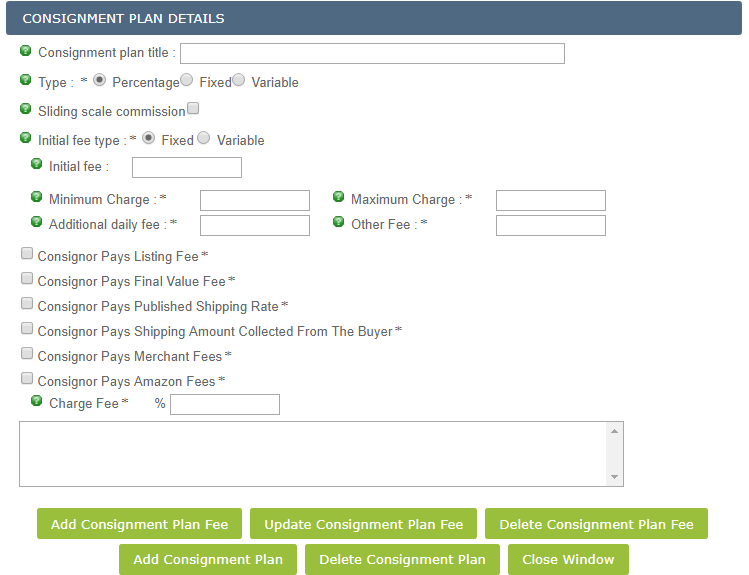 Delete Consignment Plan Fee: Delete any Plan Fee of your choosing. 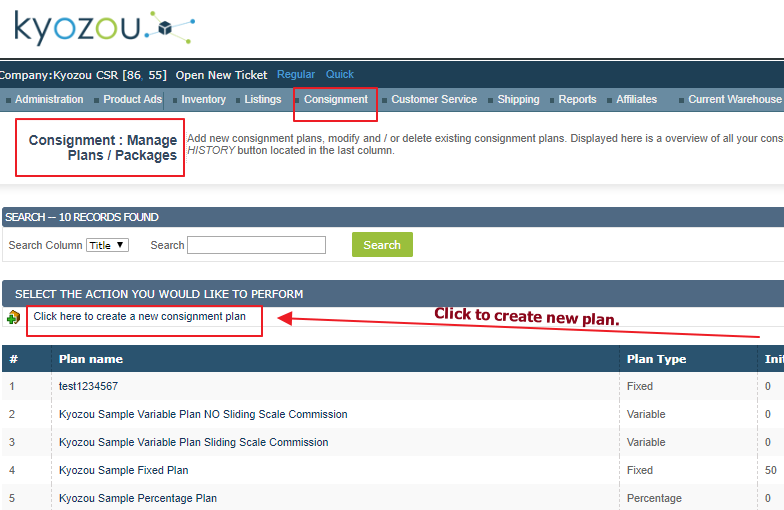 Add Consignment Plan: Click this button once you’re read to Create your Consignment Plan or Save any changes to an existing Consignment Plan. Delete Consignment Plan: Click this button if you want to remove this plan entirely. Close Window: This will close the window and won’t save any changes. Instead of specified dollar value, the consignee takes a percentage of the product’s sold price value. This is based upon overall value. Works well on Fixed Price Format items. Agreed upon rate paid, regardless of how much the final value of product has been sold for. Works well on Fixed Price format items. Lots of room for rate customization. You are able to charge a percentage fee based on capped dollar values. Great for auctions since final dollar value is yet to be determined. Click on the “Click here to create new Consignor” link and a popup will appear. Full Name: Enter Consignors full names. Password: Enter Consignors Login password. Confirm Password: Re-enter password that you entered above. PayPal Account: Add Consignors PayPal account if you choose to pay out this consignor via PayPal. Consignment Plan: Choose a Plan you’d like to designate to this Consignor. Internal Note: Add any internal notes for this specific Consignor. Consignor Inactive: Enable if Consignor is no longer consigning items with you. Address: Fill in Consignors address. Invoices: This is where the consignor’s settlement invoices will appear. Line Items: You can add Line items to a Consignor’s invoice for one-time use. This is used if a Consignor owes you money or if you owe the Consignor money. Add Consignor: Click this button once you’re done creating the consignor or saving any changes. Close Window: Close the window and cancel any changes. To add a Consignor to a Product you will need to assign the Consignor within the Product Details page when creating or editing an item. Select the Consignor from the dropdown list. You can override the Consignment plan the Consignor has set up on his account for specific items. (Example: If you’re running a promotion for a reduced rate, you can manually assign a plan per product) Leave this dropdown set to -=Use Consignment Plan=- if you want to use the default plan. Here you can view all your Consignment items at a glance and track their status. Displays the quantity that’s currently in Unsold listings. Displays the quantity that’s currently in an Order that’s not closed out yet. Displays the Initial quantity that was added for this Product. Displays the most recent sale price of the product. Displays the current Bid or Price of the product. From the View Consigned Products page, you can print an acceptance form for your consignors. It can be used as a binding agreement between Consignee and Consignor each time a consignor brings in items to sell. Select all the items you would like to print an acceptance form for. Press Ctrl+P on your keyboard to print this page for you and your consignor to sign. Hover over the Administration tab and click on Control Panel. Scroll down to the “CUSTOMIZE YOUR CONSIGNMENT SETTINGS” section. In the field “Consignment Disclaimer” You can add or edit the verbiage for the Acceptance Form. Unsettled – This will filter any Consignor Item that has not been settled out yet. Settled – This will filter any Consignor Item that been previously settled out. Product – This will only display records for Items that were sold and are in a closed order. Items will appear here the next morning after the order is closed. Listing – This will only display records for listings. This type is only used if you’re charging the Consignor for Listing Fees. Each time you list a product, a listing record gets created in the Settlements page. Generate invoice for the selected product(s) – This will generate invoices for all the unsettled items selected. If consignors have multiple items they will be grouped into one single invoice. Generate print form for selected paid product(s) – This will generate invoices with the Status “Settled” (This is used if you want to re-print a settled invoice for your consignor. Settle with PayPal – You can choose to pay your consignors with PayPal. You will be asked to login and it will send the money to the PayPal account you entered for the Consignor. A popup will appear with a preview of the invoices. Scroll to the bottom of the preview and click “Print Invoices and mark product(s) as Paid. This will settle out the product and will get it ready for paying out the Consignor via PayPal or Check. 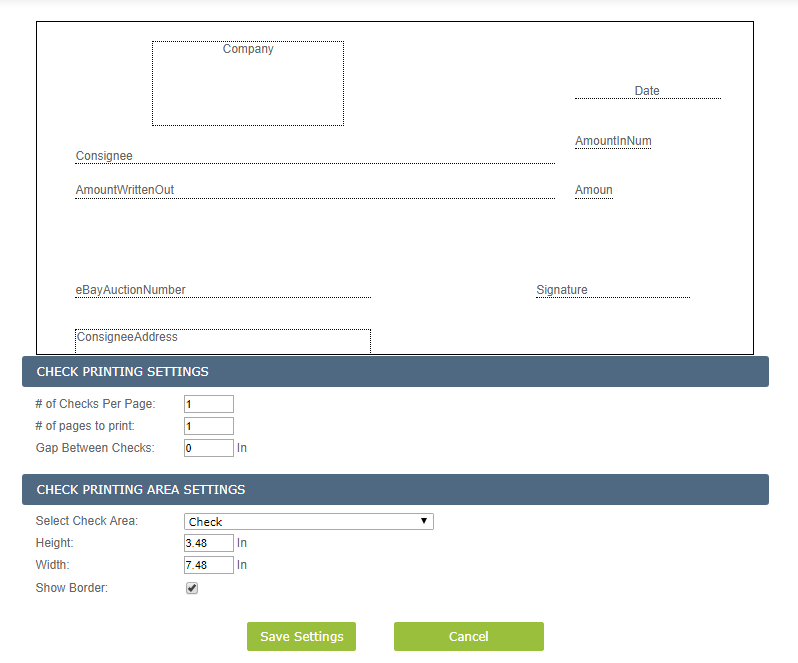 In the settlements and Invoices page, you’ll be able to customize and configure how your checks print. Click on the “Configure Check Settings” link. # of Checks per Page: Select how many checks will print on one page. # of pages to print: Select how many pages you’d like to print. Gap Between Checks: If printing more than one check on a page, pick the size of the gap between each check. Select Check Area: Selecting each option in this dropdown will allow you to select the placement of each item on the check. Check – Controls the dimensions of the full check. You can select Height, width and if you’d like to have a border. AmountCents – Controls the cent amount on the check. You can measure out the location on the check and fill in the settings. You can add a border and underline it. You can also remove it from the check by selecting the “Invisible” checkbox. This is true for all the options below. AmountInNumbers: Controls the total amount being paid out to the consignor. AmountWrittenOut: Controls the amount written out in words on the check. Company: Controls the placement of your Company Name on the check. Consignor: Controls the placement of your Consignors Name on the check. 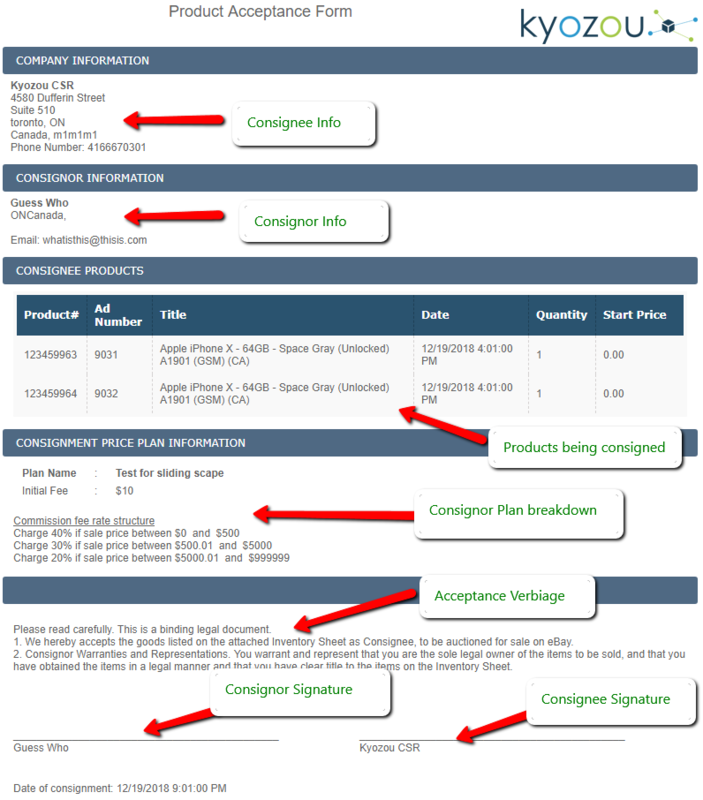 ConsignorAddress: Controls the placement of your Consignor’s address on the check. Date: This controls the placement of the Date for when the check was printed. eBayAuctionNumber: Controls the placement of the auction number on the check. If consignor has more than one auction number it won’t display this text. Best to keep this invisible. Signature: Controls the placement of the Signature text on the check. Save Settings – Click this button once you’re finished configuring your check layout. Hover over Consignment and click on Settlements & Invoices. You may also filter by the date the products were settled to make it easier to find all the products you need to print out a check for. You will receive a popup asking you to enter a number for the first check. This is used for numbering and tracking checks. If you don’t need to keep track of the number you may enter a random number. Click OK and a new tab will open with the checks that need to be printed. Once you have your Check paper in your printer, you can press Ctrl+P to print out the checks. Select all the items you’d like to pay out with PayPal.